Melvin Thomas Ott was born in Gretna, Louisiana in 1909. He played his first major league game for the New York Giants at the age of 17. He was one of only two players to play 22 seasons in the major leagues without playing in the minors, and he was the first National League player to hit over 500 career home runs. 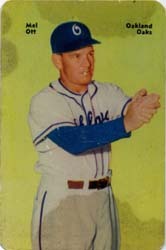 He was elected to the Hall of Fame in 1951, and the Oaks were fortunate to acquire him as manager in the 1951 and 1952 seasons.